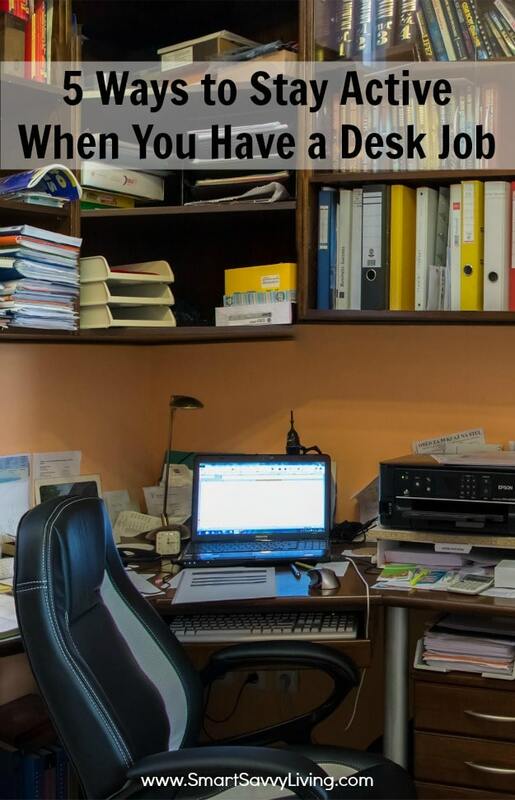 Have a desk job where you sit most of the day? These 5 ways to stay active when you have a desk job just might help you get healthier. This post contains affiliate links. Being a writer and blogger, I sit at my computer for hours most every day. Sure, I am up moving around cooking, photographing and putting things together, but the majority of my job is spent writing and editing while sitting. These days with so any careers revolving around IT, support, editing and other desk jobs, it gets more and more worrisome every time I hear about a new study detailing just how detrimental sitting so much can be for our health. While I would like to be more active while I work, the hours often escape me before I realize it. So, it was really important to me to come up with some ways to stay active when you have a desk job for myself and to also hopefully help others. 1. Find an excuse to get up at least every 30 – 60 minutes for at least a minute or two. Need to give a message to a co-worker? Why not walk over to their desk instead of emailing. If possible, go to a bathroom that isn’t right near your work area. Take a quick walk over to the water cooler. Since I work from home, I’ll take at least a couple minutes each hour to wash a couple dishes, play with the cats, get the mail, do some dinner prep, etc. 2. Make the most of your lunch and other breaks. It can be really important to take a true lunch or other breaks as allowed and not just sit at your desk eating or on social media. Not only can it help to clear your head to stay on task, but it’s also a great time to get a bit of physical activity in. Even just taking a 5 or 10 minute walk can help a lot. 3. When possible, alter your work environment. While some companies may enforce old school office furniture, many are luckily seeing how an updated work environment can help cut healthcare costs and increase productivity. Items like armless chairs or even an exercise ball to sit on can actually help more than you think as you have to put more effort into your posture. Walking desks are also a great way to get you up and moving, while still being able to do desk work. 4. Implement exercises you can easily do at your desk. While it’s obviously not possible to take extended breaks every hour to exercise, you can easily take a couple minutes now and then to do a few exercises. Take a few moments to stretch, or maybe even keep a couple light weights in your drawer to do some arm repetitions with. For something more constant, exercise peddlers that can fit under a desk are very affordably priced, especially when it comes to helping you be healthier. 5. Plan other ways you can implement more activity in your work day. Take a moment to map out an usual work day and think of ways you can implement more activity in your day. Can you bike to work on nice days? Maybe park further from the building so you have further to walk. Take at least a couple flights of stairs on your way up and down. Can you have phone call meetings while walking or standing up? If you’re like me and time passes by without you really noticing, timers can help a lot to remind you to get up for a few minutes. There are also activity trackers that can track your steps for the day, and even remind you when you’ve been inactive for too long. Do you have any other ways to stay active when you have a desk job that you use?